The beauty, health, and wealth provided by the productivity of New England’s ocean is illustrated in the diversity of ocean and coastal habitat found in the Gulf of Maine, Georges Bank, southern New England waters, and the far edge of the Outer Continental Shelf. New England’s ocean habitats provide a huge economic service, but only if the underlying ecological foundation is healthy and sustained. Pushing our ocean waters to produce more fish and seafood than is sustainable can lead to a severe decline in goods and services – as we are seeing with the most recent groundfish depletion crisis – or even to an unrecoverable collapse as has happened in eastern Canada. There are really two major components to a healthy ocean: don’t take out too much in the way of fish and other living resources and don’t put in too much in the way of runoff, nutrients, carbon dioxide, and other pollutants. 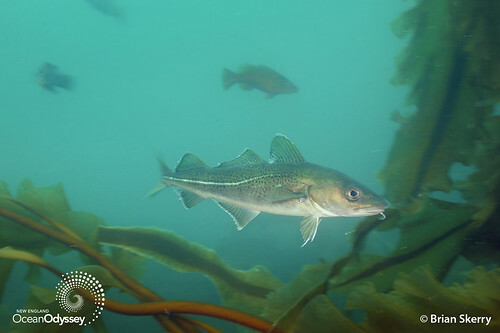 In New England’s celebrated cod and groundfish fishery we have clearly been taking out too much through decades of overfishing. The National Oceanic and Atmospheric Administration (NOAA), at the request of the New England Fishery Management Council, has for years taken the riskiest possible approach to managing fish stocks. NOAA and the Fishery Management Council have set catch limits at the highest levels allowed by law and then shown great surprise when fish stocks fail to recover. We need NOAA to show proactive leadership by ensuring a more precautionary approach to setting annual catch limits and to rebuilding fish populations. Decades of unsustainable catch levels should not continue to plague New England’s fisheries or our ocean’s health. The other problem of overfishing is that the methods used to catch fish have gotten more destructive. Since the development of more powerful engines and sonar during World War II, fishing vessels can go farther out to sea, fish in deeper water, and drag heavier bottom trawls. These inventions not only catch a lot more fish, but also cause more damage to ocean bottom habitat – the kelp beds, boulders and rocky fields, tube worms, anemones, sponges, corals, and mussel beds which serve as nurseries and spawning areas. Over decades we are left with cumulative impacts to large areas of New England’s ocean habitat. This makes the remaining special areas such as Cashes Ledge even more important as a place where small fish can grow and become large enough to reproduce. In New England, NOAA is headed in reverse on its legal responsibility and the ecological necessity to further protect juvenile groundfish in their nursery grounds. The commercial fishing industry, led by big trawlers, has argued for opening these nursery grounds. Areas of sea bottom that provide essential fish habitat must be protected from destructive fishing practices like trawling and dredging. For nearly a decade regional fishery managers have failed to take serious action to protect essential fish habitat. It’s time to make habitat conservation a priority. The Conservation Law Foundation, our conservation partners, marine scientists, fishermen, and ocean users agree that permanent habitat protection is needed for Cashes Ledge and other special places. Join our statement to NOAA asking for their leadership. Click here to urge NOAA to protect our ocean beauty, health, and wealth.